How does machine see the world humans are seeing? "Welcome to the Assessment System 2018, are you qualified to be Level 3 Chinese? " In the age of mass surveillance and commoditized information, we are all, willingly or not, constantly watched. Our devices, online presence, transaction history and even physical presence have become an asset for social network, world governments and corporations to own - we live in a digital panopticon devoid of consent and, in many cases, even awareness. As in Bentham’s architecture, the watchman’s all-seeing eye keeps us from misstepping and policing ourselves. Through Panopticon, we've created an experience of being both the "observee" and the "observer". It is a critique and a wakeup call to the alarming prevalence of mass surveillance all around us, to how tracking and surveillance devices have become largely invisible to us and to how insensitive we have become toward privacy invasion. Inspired by the system of control of the same name, we created the project “Panopticon”, an interactive media sculpture that breaks the illusion of privacy and control of our digital identity and physical presence. Multiple camera rigs monitor users throughout the exhibition space, tracking and capturing faces, and collecting the facial data to be projected on a semi-torus sculpture. The idea of Indecider came from our discussion about what part of our daily routine is worth transforming into an electronic ritual. We went from ideas that celebrates our "graduation" from a day of ITP, as many of us stay in ITP until pretty late, to posting on Facebook every single time someone solves a bug, then finally to Indecider. We want to write a small program that performs the role of the Oracle of Delphi, who is the High Priestess of the Temple of Apollo at Delphi that served as the oracle, that could let us know the "oracle" from program about our common life struggles. The oracle is actually nothing but a sentence "the answer has to do with something ..." plus an adjective word picked from a database with about 300 common english adjective words. 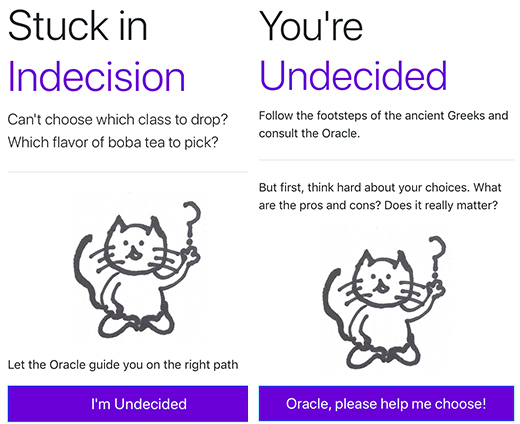 And to avoid stereotypes about "fortune telling" or "goddess", I sketched two cats, one for the "indecision" and the "undecided" pages with a question mark and one for the "oracle"page with an exclamation mark. We add a three-second waiting time before you can hit the button "Oracle, please help me choose" and a five-second pseudo-loading time for the oracle to show. Based on our own experience and our observation of others performing the ritual, proper amount of waiting time in a ritual raises people's interest in and attention on the results that's about to come out, and it helps to enhance the sense of the ritual. 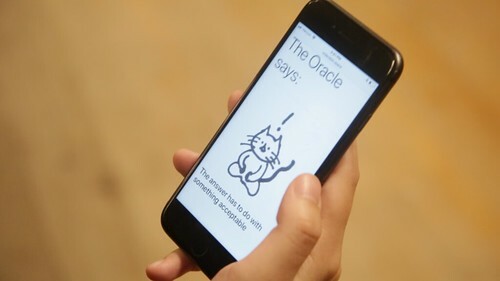 As we experienced as well as observed, most people who performed the indecider ritual consciously try to build a loose connection between the oracle and a choice they have in mind, or try to interpret the oracle and associate it with some practical suggestions. 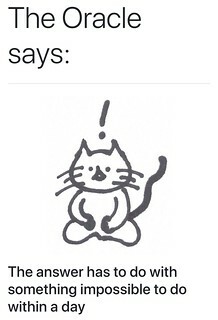 And the interpretation actually to some extend is a process to convince the person who practice the ritual something he/she prefers or has decided. 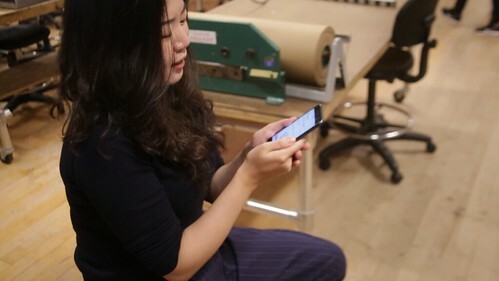 "Flappy shadow" is a project by Kai Hung and Tong Wu that allows users to create and fly a virtual bird from their own shadow puppets.